The fifth Boxer (CV 21) was launched 14 December 1944 by Newport News Shipbuilding and Dry Dock Co. Newport News, Va. ; sponsored by Miss Ruth D. Overton daughter of the Senator from Louisiana and commissioned 16 April 1945, Captain D. F. Smith in command. With the outbreak of the Korean conflict she was pressed into service to carry planes to the fighting. On 23 July 1950 she completed a record crossing of the Pacific from Alameda, Calif., to Yokosuka, Japan, in 81⁄2 days, carrying 145 P-51 Mustang and six L-5 aircraft for the Air Force, 19 Navy planes, 1,012 troops and 2,000 tons of supplies. On her return trip (27 July-4 August), she cut the record to 7 days, 10 hours, and 36 minutes. After fast repairs she departed for the Far East 24 August, this time to join TF 77 in giving air support to the troops. Her planes supported the landing at Inchon (15 September 1950) and other ground action until November, when she departed for the west coast and overhaul. Boxer departed San Diego for her second Korean tour 2 March 1951. Again she operated with TF 77 supporting the ground troops. On 29 March, Carrier Air Wing 101 ó composed of Naval Reserve squadrons called to active duty from Dallas, Tex. ; Glenview, Ill. ; Memphis, Tenn. ; and, Olathe, Kans. ó flew its first combat mission from Boxer, the first carrier strikes by Naval Reserve units against North Korean forces. She returned to San Francisco 24 October 1951. Sailing 8 February 1952 for her third tour in Korea, Boxer again served with TF 77. 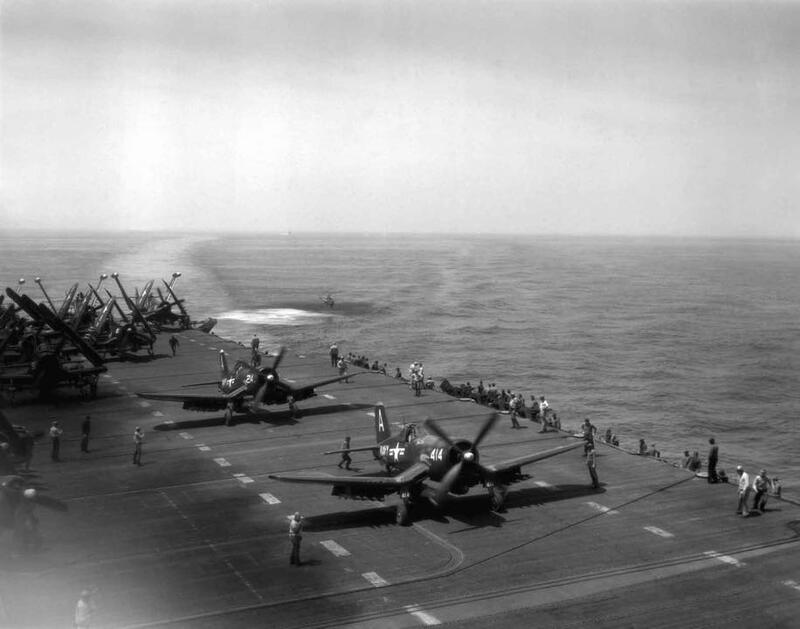 On 23 June, 35 AD Skyraiders and 35 F-9F2 Panther jets from Boxer, USS Princeton (CV 37) and USS Philippine Sea (CV 47), joined Air Force Thunderjets in an attack on the heavily defended hydroelectric power plant at Suiho, North Korea, the fourth largest such facility in the world. The plant was completely knocked out. The raid was part of a two-day aerial offensive against North Korea's 13 major power plants. On 5 August 1952, Boxer had nine men killed and two seriously injured in a fire which swept the hangar deck. After emergency repairs at Yokosuka, Japan (11-23 August), Boxer returned to duty off Korea. She arrived at San Francisco 25 September and underwent repairs until March 1953. Boxer and two LSDs arrived off the coast of Hispanola on 29 August 1964 to provide medical aid and helicopter evacuation services to people in areas of Haiti and the Dominican Republic badly damaged by Hurricane Cleo. Boxer returned to the Dominican Republic on 27 April 1965, sending her Marines ashore while the embarked HMM-264 began an airlift in which over 1,000 U. S. nationals were evacuated to the naval task force off shore as a revolt in the country threatened their safety. Boxer also participated in the U. S. space program. On 26 February 1966, the first unmanned spacecraft of the Apollo series, fired into suborbital flight by a Saturn 1B rocket from Cape Kennedy, Fla., was recovered in the southeast Atlantic Ocean, 200 miles east of Ascension Island by a helicopter from the ship. Boxer was decommissioned 1 December 1969, and stricken from the Navy List. She was sold for scrapping on 13 March 1971.